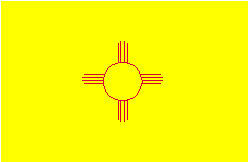 State Cowboy Song "Under the New Mexico Skies"
State Poem "A Nuevo Mexico"
State Question "Red or green?" Los Alamos: City in New Mexico, home to the Los Alamos National Laboratory, the research center for the Manhattan Project. White Sands National Monument: National monument located in southern New Mexico. Taos Ski Valley: Ski resort in Taos County, New Mexico. Bandelier National Monument: National monument near Los Alamos, New Mexico. Sandia Peak Tramway: Aerial tramway in Albuquerque, New Mexico. Angel Fire Resort: Ski resort in Angel Fire, New Mexico. Georgia O'Keeffe Museum: Museum in Santa Fe, New Mexico. Philmont Scout Ranch: Mountain ranch in Cimarron, New Mexico. Taos Pueblo: Ancient pueblo (Native American community) near Taos, New Mexico. Cliff's Amusement Park: Amusement park in Albuquerque, New Mexico. Loretto Chapel: Wedding chapel famous for its Miraculous Staircase, located in Santa Fe, New Mexico. ABQ BioPark: Aquarium in Albuquerque, New Mexico. Carlsbad Caverns National Park: National park in southern New Mexico. Indian Pueblo Cultural Center: Museum in Albuquerque, New Mexico. Petroglyph National Monument: National monument in Albuquerque, New Mexico. Albuquerque Museum: Art and history museum in Albuquerque, New Mexico. Karl G. Jansky Very Large Array: Radio astronomy observatory on the Plains of San Agustin, about 50 miles west of Socorro, New Mexico. Sandia Mountains: Mountain range near Albuquerque, New Mexico. 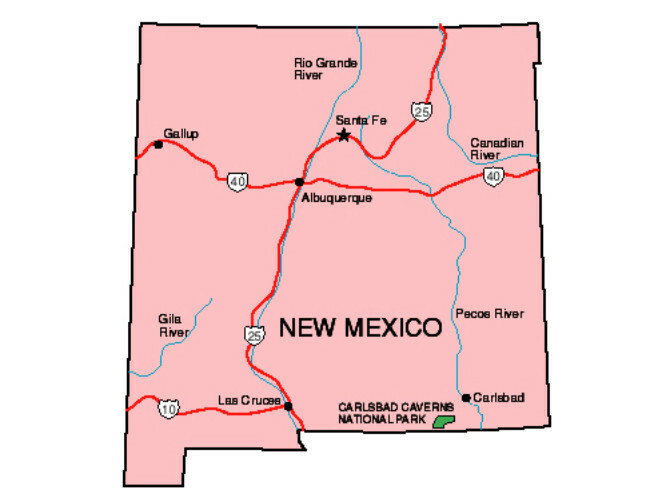 New Mexico was named by the Spanish for lands north of the Rio Grande (Nuevo Mexico). The word Mexico is named after Mexitli, an Aztec war god. Mexico means 'place where Mexitli lives." At 7,198 feet above sea level, Santa Fe is the highest capital city in the United States. 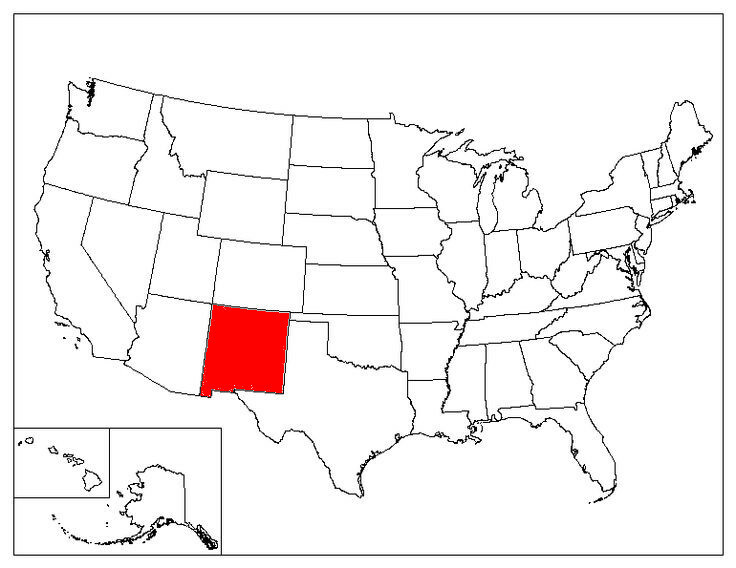 New Mexico has the largest Hispanic population of all the states. As of 2010, about 46.3% of the state's population are Hispanics. Micro-Soft was founded on April 4, 1975 by Bill Gates and Paul Allen in Albuquerque, New Mexico. The company moved to Bellevue, Washington, in 1979 since it was hard to recruit top programmers to Albuquerque. New Mexico's the only state with an official question: "Red or green?" Founded in 1610, Santa Fe, New Mexico is the oldest capital city in the United States. New Mexico is one of the states that form the Four Corners, the only location in the United States where four states intersect at one point. The other three states are Arizona, Colorado, and Utah. New Mexico is the only state in the United States where lawmakers don't receive salaries. New Mexico's lawmakers do enjoy a generous pension plan.